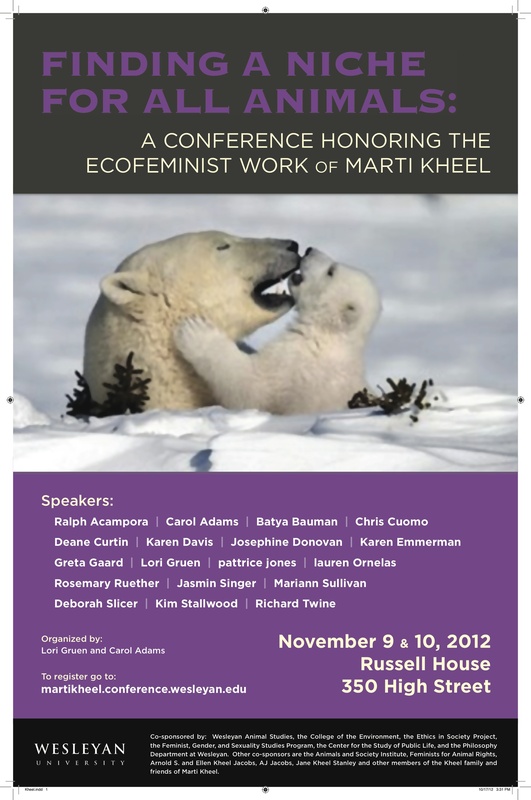 A Conference Honoring the Ecofeminist Work of Marti Kheel at Wesleyan University, New York in November 2012. Presently, I am preparing to make a return visit to the USA from Thursday, November 8 to Saturday, December 1. This will be my second trip to the USA since leaving five years ago after living and working there for 20 years. I am looking forward to the trip very much. I grew to appreciate the USA notwithstanding its annoyances. Well, everywhere does have them, including the UK where I live now! It will be a busy three week and three day schedule, which I would like to share with you. I would love to see everyone again who I enjoyed meeting during my time there. But, realistically, that won’t be possible. Nevertheless, send me an email at kim@kimstallwood.co and let’s see if we can schedule a telephone or Skype call while I’m there. Better still, please get in touch to see if it’s possible to meet in the places which I will be visiting or at the events where I will be speaking. 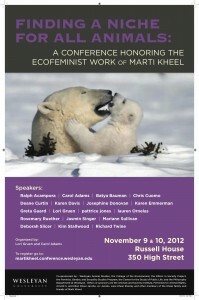 This conference from November 9 to 10 at Wesleyan University in Connecticut will celebrate the unique contribution Marti made in developing our understanding of animal ethics and, in particular, ecofeminism. I will be presenting as a member of a panel looking at the practice of advocacy. My focus will be on the impact ecofeminism made on my understanding of what form animal advocacy should take. The line up of speakers at this conference is truly outstanding. To single anyone out would be unfair to everyone else. I am truly honoured to be part of it. I will be in NYC the week of November 12 and would like to see as many people as possible. Drop me an email. I will be spending Thanksgiving week with Sue Coe, which will hopefully involve lots of eating, walking the dogs in the woods and arguments about this and that. The remainder of my trip is spent with my colleagues at the Animals and Society Institute, which is based in Ann Arbor, MI. I will be spending Monday, November 26 to Thursday, November 29 particularly with Bee Friedlander but I suspect there’s going to be a reunion of sorts of ASI folks taking place! On Monday, I will be joining Bee when she makes a presentation at the University of Michigan Dearborn and to the class of Fran Dolins, professor of psychology. Also during this time I will be speaking with ASI supporters to catch up and thank them for all that they do for the animals. 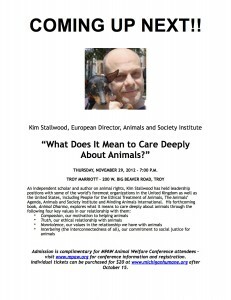 Yours truly will be speaking the evening before the Michigan Partnership for Animal Welfare conference on Thursday, November 29 in Troy, MI. My presentation is the pre-event to the annual Michigan Partnership for Animal Welfare conference. I will be speaking here, as well, and will be discussing ‘USA – UK: Who is Making More Progress in Animal Welfare?’ Provocative, eh! I am also putting to the bed the manuscript for my first book which will be published by Lantern Books next year. It’s been a longtime coming. The only thing I want to say about it now is that it is my intention to return to the USA in 2013 to travel throughout the country to share with folks the ideas I explore in my book. 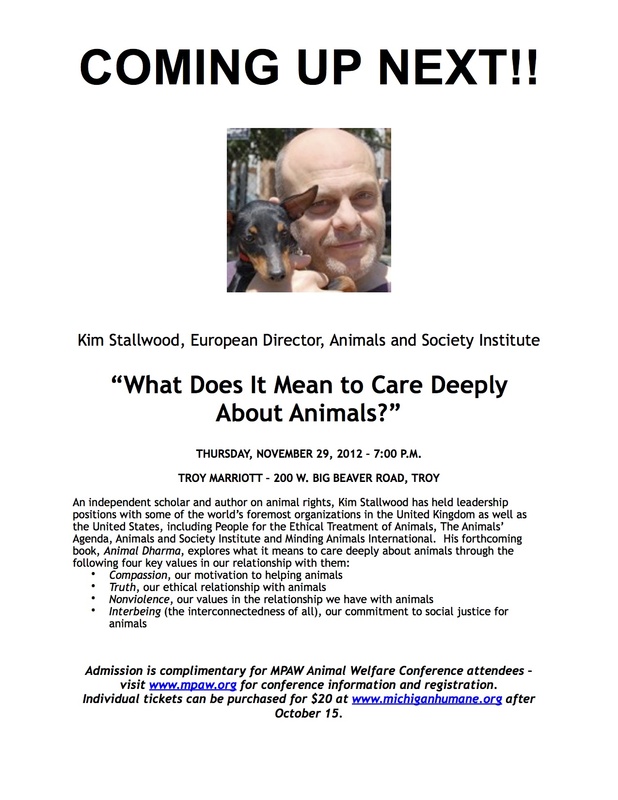 This tour will be produced in partnership with the Animals and Society Institute. ASI is very dear to my heart because one of our objectives is to help further establish Human-Animal Studies. HAS is the study of our relationship with animals and theirs with us. I firmly believe moral and legal rights for animals will be made even more possible with new generations of academics and scientists informed in animal studies playing prominent roles in society. I also want to partner with other animal groups. Please get in touch if you’re interested. This book, which started life as Animal Dharma, has gone through many changes. You can read earlier extracts here. So, if we fail to connect this year, well, there’s always 2013!